Sometimes I really don’t know where my computer is and it’s crazy because I almost don’t care. If it wasn’t for doing homework or refining my incredible binge-watching skills, I honestly think someone could steal my MacBook Air and I may not realize for a few days. However, try to steal my beautifully scratched iPhone 5S and I’ll probably have a meltdown within five minutes and the thief will rue the day. In high school I used to get home from practice, watch TV, eat dinner and then go sit in front of the family desktop computer for hours. Most of the time I didn’t need my computer for the homework but I needed my computer to talk with my friends. Whether we go all the way back to the AIM days (and my ridiculous usernames) or we just go back to the initial use of messaging friends over Facebook, I was always talking to someone and I needed my computer to do that. Of course I would use the computer for other things -aimlessly browsing, looking up random information, playing Sporcle quizzes to memorize even more random information. Other times I would go onto ESPN and read all about my favorite New York sport teams – player interviews, coach interviews, updates on who’s playing well or who’s hurt. Sometimes, I’ll admit, I would even go read the real news. Now, it’s 2017 and I had no idea if my laptop was fully charged to write this blog and to be honest, I really had no clue where my laptop actually was. Almost everything I used to need a computer for in high school is now carried around in my pocket and in most cases, it’s easier and more efficient to use my phone than it was to use my computer. The advancements in technology and the evolution of social media are directly correlated and in the most simplistic sense, it’s now easier than ever to become connected and stay connected with people all over the world. You don’t need AIM Instant Messenger on your computer and you don’t need to write on people’s Facebook Walls to get in touch with them. There’s an app for that. 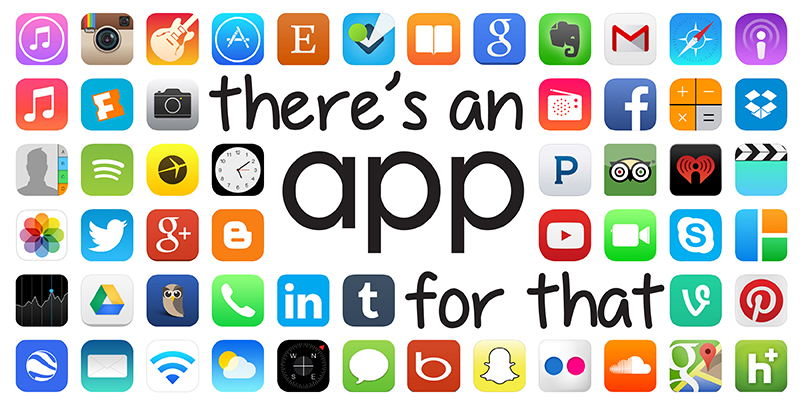 There’s way more than one app for that. Pick your favorite way to stay connected with people and become addicted…or use at least ten like I do and have your phone become part of your hand. Social media itself has evolved from just staying in touch with people and that’s why I don’t care where my computer is about 80% of the time. During winter break I used my computer less than ten times in 4 or 5 weeks but I have access to more information than I ever did using my computer 4 or 5 years ago. I’m certainly not as active with posting on social media like I was in high school but I use social media way more than I ever have. Facebook, Twitter, Snapchat are no longer just means of connecting with friends – they’re means of staying connected to world news in real time. I don’t have to go on the computer to find out what’s going on in the world and I love it. With the use of Twitter, anyone can become a source for news which is great and useful but I also urge caution because the #FakeNews phenomenon sweeping the internet. Personally, I follow a variety of verified news sources that allow me to be informed quickly in less than 140 characters. I also follow four different beat writers for the New York Rangers who cover each practice and every game – that way I never miss anything. It’s potentially excessive and my dad makes fun of me but then again, he’s the one that texts me asking for the most up to date information on the team. The fact that I don’t instantly know where my laptop doesn’t bother me at all and I’m not the only one. As of late 2016, the PC market has declined for 8 consecutive quarters and the forecast for the future does not look good. People just aren’t buying new computers anymore and they’re opting for tablets and smartphones because they can do everything that a computer can do. The power of social media is dynamic and it’s growing at a rapid pace. Applications that were once just useful have transformed into social sharing platforms. For example, you can transfer someone money over an app and all your friends can see it #VenmoMe. A random Venmo user convinced over 2,000 people to send him money with a sign on ESPN College Gameday requesting beer money from his mom. I’m not taking this class to convince people to send me money on Venmo (but you can if you want @Terence-Nixdorf). As I previously mentioned, I use social media to stay connected to my friends and family as well as just discovering new things and staying informed on things happening around the world. However, I know that there’s way more to social media and digital business than the way that I currently use it and I’m excited to discover these alternative methods and new trends through class discussions, presentations, and tweeting with a purpose. Dude, where’s my computer? It’s in my pocket and it’s called my iPhone. (My laptop was in my backpack and it was not charged). I think you’ve hit on a nice distinction. Computers are for work. Mobile devices are for connecting/ communicating….much in the way these technologies always have been. Great point. I use my personal computer only 3 times a month. I have a work laptop, but only engage in work activities on it. The smartphone has replaced personal laptops as social media ha become more accessible. Interesting point! Haven’t necessarily thought of it this way before. Now that I think about it, I use my laptop mostly for school/work purposes, occasional shopping and streaming. The latter two can be easily done from mobile, since most retailers have dedicated mobile apps and you can stream from your phone to TV. It’s more of a habit/preference at this point. School and work purposes are a little trickier (not a fan of reading/writing very long academic texts and juggling between multiple files on my iPhone), but I think that’s due to the lack of applications that are truly native to mobile and make use of the capabilities of mobile devices, as opposed to just “adapting” desktop apps. I believe it can and will change in the near future as well.